At The Awning Man, we supply three different types of awnings: Standard Awning; Half Cassette Awning (also known as Semi Cassette Awning); Full Cassette Awning. The three different types of awning represent the amount of casing it has to protect it from the weather when not in use. If you are unsure which awning type you require, please read our awning descriptions below. The awning can be opened as much or as little as you like up to the maximum projection. You can alter the slope of the awning from almost horizontal to a relatively steep tilt of approximately 40 degrees from the horizontal. The picture left is of our new 24 model. 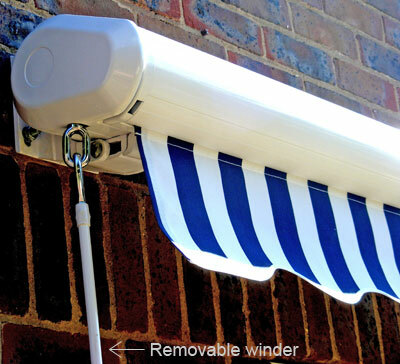 Our half-cassette awnings have a metal casing which protects the fabric roll when retracted. It doesn't go all the way round - for this you need the full cassette. The valence does not retract into the cover but can be removed. Both manual and electric awnings are available. Manual operation is by way of the winder on the side. It is adjustible to enable you to alter the slope of the awning from almost horizontal to a relatively steep tilt of 35 degress from the horizontal. 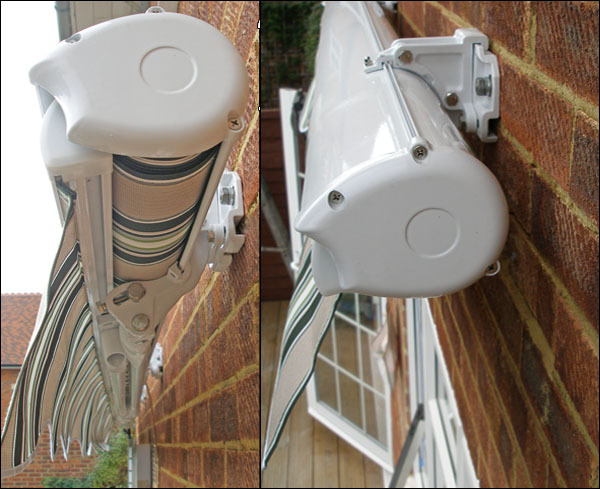 Awning retracts into a casing which completely covers the fabric, protecting it from the elements. 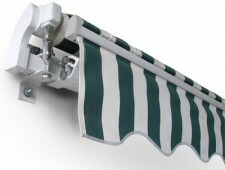 Both manual and electric awnings are available. Full cassette awnings are the strongest of all our awnings. The integrated gutter in the front bar also allows water to run off easily. The slope of the awning can be changed from almost horizontal to a relatively steep tilt of approximately 30 degrees from the horizontal.